Summary : Ride along the Parramatta Valley Cycleway, over Silverwater bridge to Sydney Olympic Park, then on to Concord for coffee. Return via Brays Park and the John Whitton bridge. 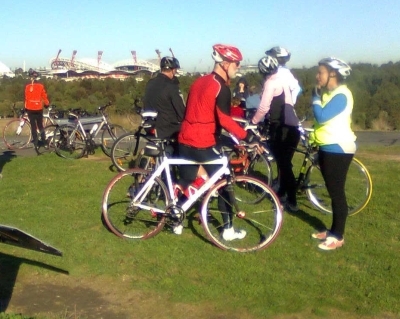 Ride along the Parramatta Valley Cycleway to Silverwater Bridge. Cross the river and travel along the River Walk past Newington Armoury Wharf on your way to the Woo-la-ra marker. Climb to the top and enjoy the 360 degree view. Ride down off the marker and head for Wentworth Common and the top of the Bay Marker. Drop down off the Bay Marker and follow Haslams Creek over Kronos Hill to Olympic Boulevard. Travel through the Olympic Precinct past the major sporting venues and on to Bicentennial Park. Exit the park and enjoy the quiet back streets as you wind your way to Concord for coffee. After coffee return to the start via Brays Park Reserve and the John Whitton Bridge.